👋 Hi! Me : Xavier Lefèvre Job ! : Team leader of React and React Native projects Company 🏢: BAM, a tech consulting and development agency Passion 🤩: I love tech as much as I love travelling which means I’m super happy to be here! I do also love motorcycles. Why? With our client, we produce several web apps per year for different targets but with the same business behind. So very similar components were remade from scratch many times. Let’s dive in for some tips! What is a breaking change? A breaking change is a change in one part of a software system that causes other parts to fail. Which happens when you change the existing API of a library without warning your users. How do we know our project is successful? Our return on investment components Σ( Component cost if developed on “normal” project X Number of times of reuse of the component )- Component Studio full cost The tech team main focus is to reduce the project cost by approaching a flawless codebase and a fast development process. But we did not arrive to this point without struggling 🤯! So we started tracking issues… Number of issues VS Contributions Every problem the contributors meet on the project they create an issue for the core team. We saved around 18% of development cost since April 2018. Now the UI is naturally more consistant across all apps. And this is our development flow How do we know it’s worth it to add a new shared component? Anticipate breaking changes!! Know when to add a new component! 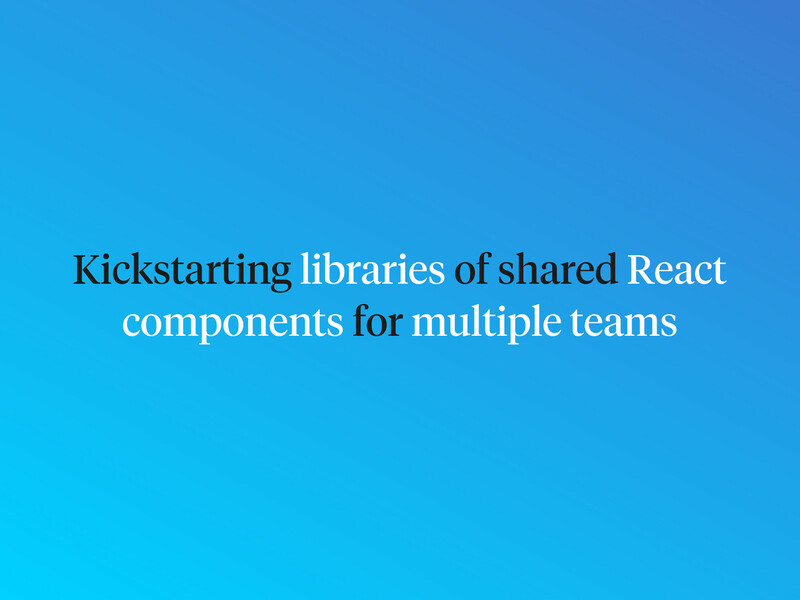 View Kickstarting libraries of shared React components for multiple teams on Notist. In a company, as the technical teams grow and work on different projects, the question of creating a set of common components naturally arises. This is what happened to us: over the years different teams redeveloped very similar components, from simple UI elements to complete business features. 9 months ago, it was time for us to take a step back and think: how can we do better? Today, five teams re-use and contribute to our common libraries on a daily basis, and other departments are expressing a big interest in it. And we even worked through extracting performance indicators, proving us that it was worth maintaining such a collaborative project - that could help you convince your co-workers that it’s worth investing time in such a project. You won’t regret it! Xavier puts presentations on for free. You can too. As crazy as it sounds, I am in Bangalore 🤩 to speak at @ReactFoo tomorrow! I'll be giving advanced tips to develop libraries of shared #React components for your company. Also as @Florianrival pointed out, I added advanced details about our architecture and development flow in the appendix!